Before I start, I have to admit that the Acqua di Parma colognes have never really floated my boat, but very kindly the company have sent me some samples to try, and as it’s one of the most popular men’s fragrances I wanted to explore why that might be. 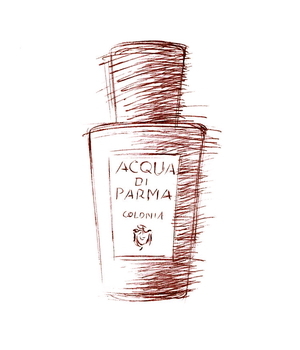 There are lots of things to like about Acqua di Parma Colonia. Its packaging, for starters, is wonderfully elegant: a golden-yellow, linen-textured cardboard tube, which splits exactly in half to reveal the bottle tightly nestled inside. The bottle itself is a beautifully judged design, in plain glass with gently flared shoulders and a chunky black cap to match. And the typography is lovely: effortlessly stylish, with something of the 1920s about it. The whole package is an object lesson in how to make a product that says ‘classic’ and ‘quality’. So what about the scent inside? Again, it’s classic and simple – perhaps a little too simple for me. The original Colonia was launched in 1916, and I’m presuming it was always a fresh, citrussy eau-de-cologne, though like pretty much every long-lived fragrance on the market it will almost certainly have been reformulated over the years. That’s not always a bad thing, and today’s version may well smell more sophisticated than the original; Agua de Colonia by the Spanish brand Alvarez Gomez, for example, may conceivably have been less tinkered with, but by comparison it smells quite crude and harsh. Not that Colonia has a particularly complex character: it’s intensely lemony when first you spray it on, but as the sharpness of the lemon fades into the background you get the clean, herbal smells of rosemary and lavender. So far so classic eau-de-cologne, but what makes Colonia different is the fact that it’s also blended with rose, which adds an unobtrusively feminine touch – a bit like the artificial jasmine scent at the centre of Eau Sauvage, though not nearly as striking in its effect. The rose (I think) also makes Colonia smell rather talcum-powderish, which is pleasant enough but comes across as somehow rather old-ladyish – I guess because we associate powdery perfumes with an older generation. It certainly smells clean and fresh, in a soapy kind of way, and perhaps that explains its popularity among men for whom smelling clean and fresh is the main (and often only) purpose of perfume. Personally I want to smell a bit more interesting than fresh laundry, and my other problem with Colonia is that it doesn’t last: within an hour or two I can hardly smell it on my skin. Again, that may be part of its appeal for men who are a bit nervous about wearing scent of any kind, so horses for courses, I suppose. After its glory days in the 1920s, the Acqua di Parma company limped along until 1993, when it was bought by three rich Italian businessmen whose money came from Ferrari cars, Tod’s shoes and La Perla underwear. They launched scented candles and the like, but it wasn’t until after the luxury conglomerate LVMH took a stake in 2001 that the Colonia range was extended. First came Colonia Assoluta in 2003, followed by Intensa in 2007, Essenza in 2010 and Intensa Oud in 2012. I have all of these versions apart from Intensa Oud, and I have to admit that, though I thought I had a fairly sensitive sense of smell, the differences between them are so subtle that I find them almost impossible to tell apart. Colonia Assoluta was formulated by two of the best-known perfumers around today: Jean-Claude Ellena (creator of Vétiver Tonka, among others) and Bertrand Duchaufour (creator of many unusual fragrances, especially for L’Artisan Parfumeur), which is a bit like getting Debussy and Ravel to compose a duet. The results should be extraordinary, but these two great talents seem to have cancelled each other out: Colonia Assoluta is discreet to the point of invisibility, like a plain grey Hermès jumper. What Duchaufour and Ellena seem to have done is shuffled a few of the ingredients of the original Colonia about a bit – changing the lavender for jasmine, for example – but it’s all so carefully balanced that the overall effect is almost identical, though you can smell a faint difference after an hour or two. Their work is certainly very subtle and clever, like Gus Van Sant’s frame-by-frame remake of Psycho, but you could argue that it’s equally pointless. The same conjuring trick, if it’s fair to call it a trick, seems to have been achieved with the Essenza and Intensa versions: in each of them the ingredients are slightly different, but their smell is even less varied than their packaging (Essenza comes in a black tube, but is otherwise, ahem, a carbon copy). Brilliant or bonkers? Delicious discreet or disappointingly dull? I’ll have to let you compare them for yourself. Maybe my nose isn’t as super-sensitive as it should be, but I’d be interested to hear what other people think. All the same, thank you to Acqua di Parma for letting me give them a try: they certainly look very handsome on my perfume shelf. I wouldn’t normally suggest starting your day with a gin and tonic, but that’s exactly what the ‘pure perfume’ version of Voyage d’Hermès smells like when first you spray it on. It’s not really gin and tonic, of course, but it does share two important ingredients: alcohol (which doesn’t in itself smell of anything) and juniper, which adds its bracing, slightly bitter fragrance to both gin and Voyage d’Hermès parfum. So why not simply spritz yourself with a glass of Gordon’s? It would certainly be cheaper, but if you smell it again after a few minutes you’ll notice that Voyage d’Hermès parfum has more to it than gin. In fact it develops into a very pleasant, slightly spicy-smelling scent, with hints of coriander and pepper and a warm, comforting woodiness underneath. Launched in 2012, this is in-house perfumer Jean-Claude Ellena’s second take on the original Voyage from 2010, which (backed by a serious advertising budget) went on to become a big seller for the brand. While the original version is a relatively insubstantial eau de toilette – that is, the liquid in the bottle contains around 10 per cent actual perfume, diluted in odourless alcohol – this revised version is labelled as ‘parfum’, or ‘pure perfume’. But is it? In industry jargon, to call something a ‘parfum’ generally indicates a concentration of around 40 per cent, with a punch – and a price-tag – to match. Yet Voyage d’Hermès parfum costs only around £10 more than the earlier eau-de-toilette, which seems odd. (For comparison purposes, a 50ml bottle of Chanel No5 eau-de-toilette costs about £55, while a mere 30ml of the parfum would set you back £220.) 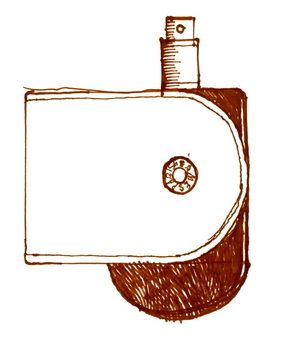 Nor does Voyage d’Hermès parfum last as long as you’d hope a ‘true’ perfume would; in fact it doesn’t even last as long as other Hermès eau-de-toilettes such as Equipage or Bel Ami, which can see you through the day. So what’s going on? Like other online reviewers I suspect that what we have here is actually what’s known as an eau de parfum, with a concentration of between 15 and 20 per cent, which has been inadvertently mislabelled as a parfum. That’s a shame, as the world of perfume is mystifying enough without muddling up its terminology. Maybe Hermès can explain. That gripe aside, Voyage d’Hermès parfum is an attractive, easy-to-wear fragrance, and like its predecessor it comes in a nifty bottle (in charcoal grey rather than the earlier version’s clear glass) that swivels within a protective metal case. OK, it’s a bit of a gimmick, but it’s been nicely done given the cost constraints of a mass-produced scent, and as a perfume it’s a safe choice for anyone who isn’t, perhaps, too confident about wearing anything too offbeat or eccentric. Or who simply enjoys the occasional G&T. If there’s one scent that appeals to pretty much everyone then surely it’s eau-de-cologne, the zesty, refreshing blend of lemon and herbs whose (probably medicinal) origins are lost in the mists of time. Its oldest surviving surviving incarnation is the German No. 4711 Echt Kölnisch Wasser from – where else – Cologne, which you can buy for not very much from pretty much anywhere, but there are hundreds of other versions, from the cheap and nasty all the way up to Chanel’s divine (and divinely expensive) Eau de Cologne. The basic ingredients of eau-de-cologne are extracts of citrus fruits, which give it its instant freshness, blended with a variety of herbs, usually including lavender and rosemary, which add extra staying-power and warmth. It’s more of a style than a formula, and every different eau-de-cologne has a slightly different combination of ingredients, though they all share a broadly similar character. They all suffer from one drawback, too, which is that they quickly fade away on the skin. 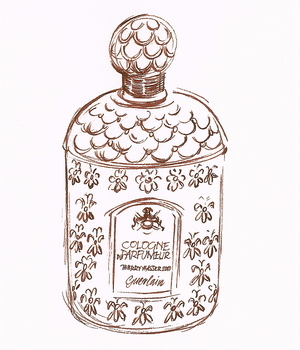 As one of the most historic perfume companies, Guerlain has produced a number of different takes on eau-de-cologne over the years, starting with Eau de Cologne Impériale in 1853, followed by Eau de Cologne du Coq in 1894, the glorious Eau de Fleurs de Cédrat in 1920, and Eau de Guerlain in 1974. Cologne du Parfumeur was launched in 2010, and is the first not to have been dreamed up by a member of the Guerlain family. Its creator, the Swiss perfumer Thierry Wasser, became the company’s in-house perfumer in 2008, after the retirement of Jean-Paul Guerlain. Wasser’s interpretation of the classic eau-de-cologne retains plenty of citrusy zing, but with more orange than lemon in the mix, which makes it smell slightly sweeter and less astringent than the general run of colognes. The blend of orange used here is particularly ‘green’, which makes a bit more sense if you think of orange flowers surrounded by their glossy dark-green leaves. Wasser accentuates this ‘greenness’ with tiny amounts of fresh-smelling mint, as well as plenty of lavender and rosemary, those classic eau-de-cologne herbs. I think I also smell a little bit of bracing juniper, which gives Voyage d’Hermès its gin-and-tonic swing. Overall it’s a gentle, appealing scent, and Wasser has given it extra staying-power thanks, it seems, to the inclusion of long-lasting synthetic musks, which add their own soft, slightly sensual touch. Cologne du Parfumeur comes in Guerlain’s classic ‘bee’ bottle, with fish-scale patterned shoulders, 69 stylised embossed bees on the sides and a rather cheap-feeling plastic top, though customised, hand-gilded versions are available for a suitable fee. What’s most interesting is its label, which includes ‘Thierry Wasser 2010’ – a new departure for Guerlain, and one of the earlier signs that perfumers had started becoming celebrities in their own right.